Hi there – As I recently mentioned, our 2018 was a bit chaotic with curveballs and moving and changes and whatnot. With all the uncertainty and upheaval of the year, I never felt the time was right to share with you my daughter’s nursery. I poured so much love and thought into this nursery. The room made me so happy! It was the lightest, brightest, most joy-filled room in that house. Leaving it was very tough. But now, I’m gearing up to decorate our new home. Keeping in line with our “back to the basics” theme for January, I’m really endeavoring to make this house a home. Before delving into the details, I simply must extend a huge thanks to my friend Laura Umansky of Laura U Interior Design. None of this would have been possible without Laura! As a mother to twin girls, she understood not only the design elements but the personal meaning behind this project. She, as per usual, completely understood my vision and brought it to life. Thank you, Laura! I don’t know about you, but anytime I’m decorating a room, I seem to anchor the project with one or two or three items that I absolutely adore! With those statement items in mind, I then build the rest of the room around that. 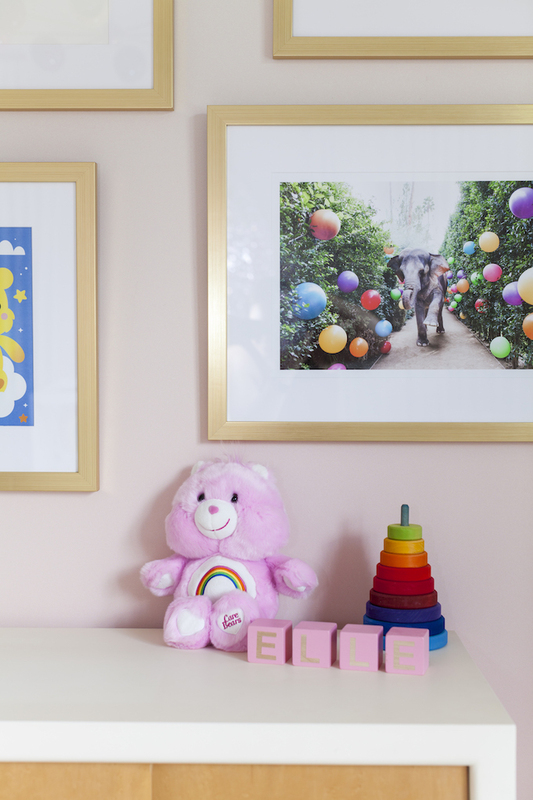 Well, in this case, I had three key elements around which I knew I wanted to work: (1) the custom Ashley Longshore painting I commissioned for Elle, (2) this gorgeous blush ombre wallpaper, (3) this show-stopping rainbow chandelier. As for the painting, I knew I wanted a very personal art piece in my daughter’s room. I wanted something that would inspire her and guide her over the years. I had this idea for something that conveyed to her all my wishes for her. So, I commissioned my friend Ashley Longshore to create this masterpiece! I literally just jotted down words on my iPhone notes app for a week or so. Once I was confident that I had my wishes pretty much covered, I just text the list to Ashley and let her run with it. No surprise – she nailed it. I could not be more pleased with this art! And it makes my heart ridiculously happy to peek in on Elle on the nursery camera and see her standing up gazing at the painting, touching the bottom of it, and taking in all the positivity. Now, the wallpaper was inspired by Paloma Nails here in Houston. When they first opened, the owner invited me in for a complimentary manicure and pedicure, and I was immediately blown away by the interior design. The whole thing is so good. But I couldn’t take my eyes off this beautiful ombre wallpaper she had installed. I of course inquired as to where it was from, and she told me Calico Wallpaper. Now, hers was a different color palette. 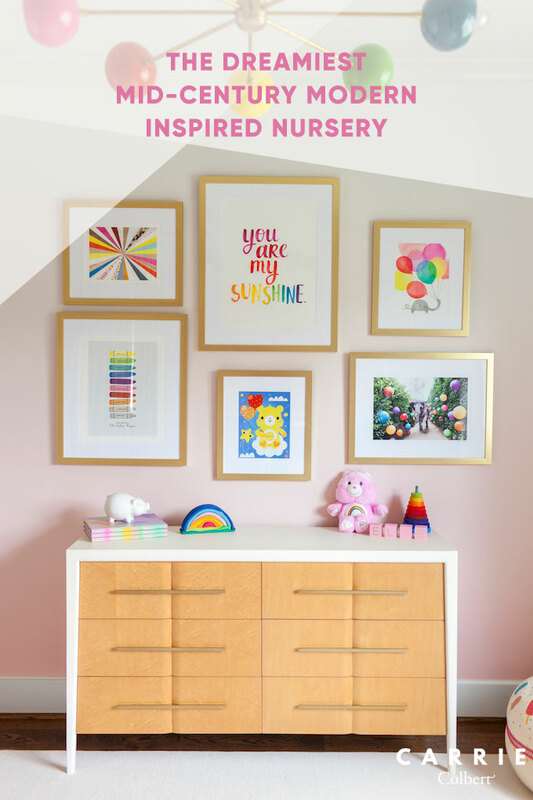 But from then on out, I had it stuck in my head that I wanted to incorporate some Calico Wallpaper into an interior design project at some point – and the nursery provided the perfect opportunity for that! Besides those two key elements, I wanted a statement chandelier. I wasn’t sure what I wanted, but I was certain I would know it when I saw it! The search was not easy. I searched high and low for the perfect lighting. And when I discovered Sazerac Stitches and then saw this particular chandelier, my heart skipped a beat. I knew my search was over! I mean – they should just rename it the More Color, Please chandelier, right? Ha. As a side note, the Sazerac Stitches team couldn’t be any more wonderful! The pair is a lovely husband-wife team from New Orleans. Don’t you just love supporting small family businesses? Stay tuned for more of their lighting in the new house! Well, it’s hard to narrow it down. There are so many special little moments that I love in this nursery. 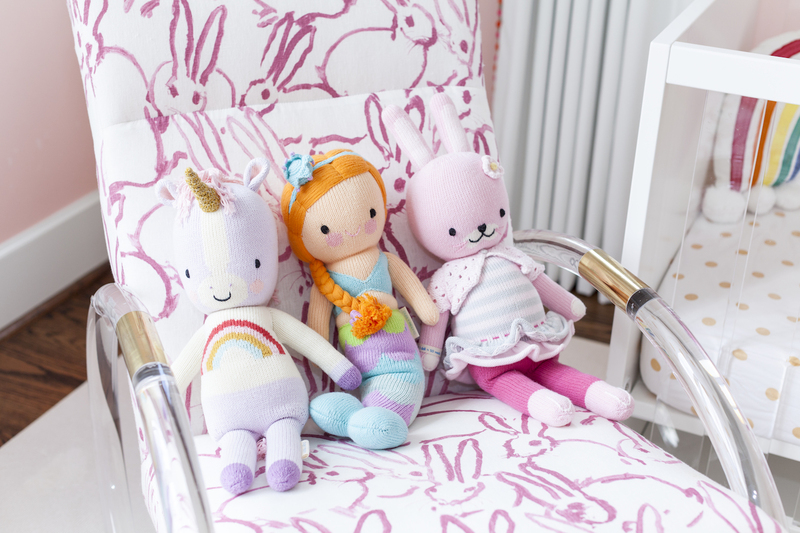 Elle and I had many special times in that rocking chair with Gina Julian’s adorable elephant art looking over us. We loved sitting on pillows under that tree bookcase and reading stories together. One more very special touch: the “You are My Sunshine” watercolor that my friend Amy Tan made for the room. That song holds a special place in my heart, as my grandmother used to sing it to me. So, to have those words emblazoned in Elle’s room in a customized manner meant a lot. Drapery: These blackout drapes in “Marscapone” are from Crypton Home Collection. We added the colorful pom poms from Kravet’s Jonathan Adler Collection. Rocking Chair: No run-of-the-mill rockers here! 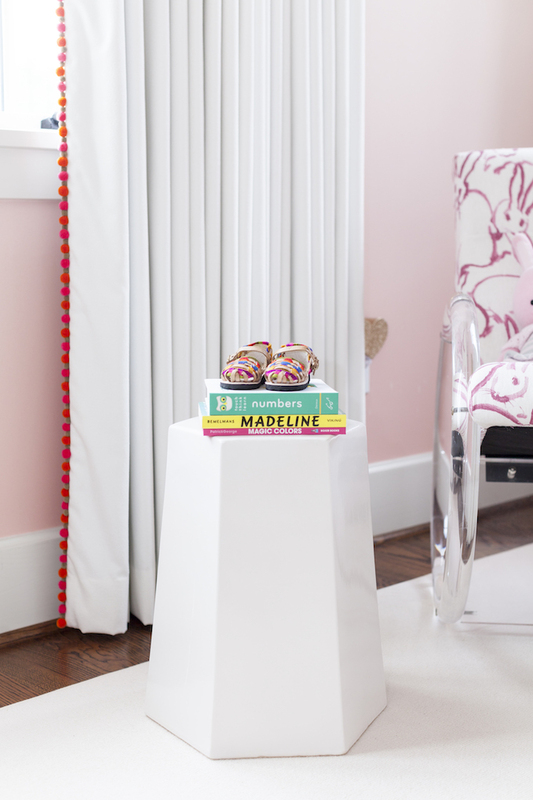 This chair from Scout Studio is such a refreshing take with its round lucite arms. It is covered in Hunt Slonem fabric. Wallpaper: The pink ombre wall covering is Aurora Petal by Calico Wallpaper. It is custom-fit for the nursery space. As with any interior space, what made this room special was all the love that we poured into it. Leaving it was hard. Even harder is knowing it’s not even in existence any more. As I wrote all of this, though, I tried not to get sad, but to reminisce with fondness. Plus, I look forward to creating special moments like this in our new home. Thanks for reading along. If you enjoyed this space, I’d appreciate you sharing! Pin it, email it, share it, comment it… It all means a lot, as this is like sharing a little piece of my heart. What a beautiful space. I’m sure you will create something special for Elle in your new home. This is the stuff dreams are made of!!! I love every square inch! Ah, thank you so much, Holly!!! This is the dreamiest room ever! Every single detail is beautiful! Ready for spring with this blush, babydoll dress.